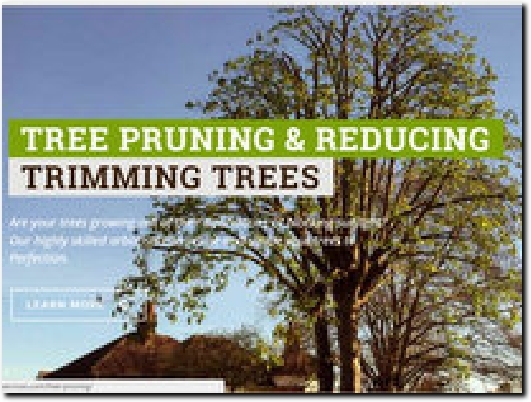 We supply every type of tree services including tree felling & removal in Surrey, pruning works, stump removal & grinding in Surrey, emergency tree services, ivy removal in Surrey, hedge trimming, tree planting and commercial tree services. You can have full peace of mind when working with us as we hold a £5million public liability insurance policy. Our teams consist of specialist climbers and trained groundsmen, all with NPTC qualifications and first aid certificates. We work all around the London and Surrey border and have Call us today to have one of our tree consultants inspect your trees for free. Our quotes are free include the removal of all waste. Surrey-based family-run business offering a wide range of arboricultural services to commercial and private clients. Members of the Arboricultural Association with fully-trained and certified staff. About Us leads to testimonials from satisfied clients. The Services tab lists the services available and gives information on each process, which includes a quote form. Contact Us includes the business address, e-mail address and phone number, and a contact form.